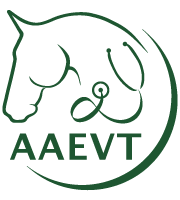 AAEVT | Anesthesia meeting was a HUGE success! Anesthesia meeting was a HUGE success! 28 Mar Anesthesia meeting was a HUGE success! 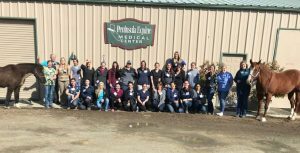 Our Basic to Intermediate Anesthesia Event, held last weekend in Menlo Park, CA at Peninsula Equine, was attended by 26 techs and assistants from 8 different states and Canada! Most were able to meet up by the pool at Dinah’s for a Welcome Reception Friday evening, which everyone really enjoyed – even though it was not exactly “pool” weather! Saturday the sun came out and we got down to business. 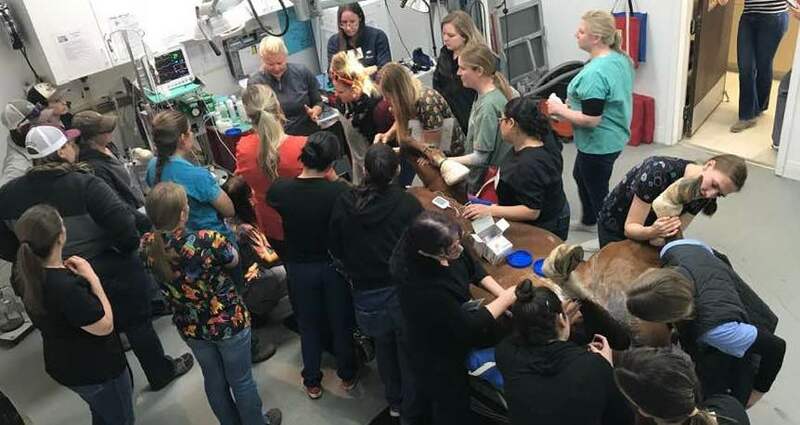 Upon learning where everyone was from and their background, we found that many of these attendees were brand new to equine anesthesia – and very much looking forward to learning all they could. We had lectures in the morning by Dr. Bidwell and then a fabulous Chuck Wagon style Tri Tip BBQ lunch by Stuart Nelson (our Patterson Veterinary Rep). After lunch we broke into groups and rotated through several hands-on labs, learning about Anatomy relevant to Anesthesia and dissection, practicing catheter placement, and suture techniques. We then ended Day One with a wonderful dinner sponsored by Zoetis and JD Medical at iTalco Restaurant – where Paula Whittler, Zoetis Rep, gave us an overview of their new products, Rabies in horses, and engaged some good discussions. Sunday morning brought a beautiful “Bay Area” day and we were amazed at how well these attendees listened to the lectures and information…and retained it! After a wonderful Taco Bar lunch sponsored by KindredBio and Joycalyn Meroshnekoff, we prepared for our Inhalant Anesthesia lab. Attendees were given areas of responsibility and so were able to learn more about the Anesthesia machine, sedation protocols, while getting to practice (in small groups) catheter placement and monitoring. Thank you MAI for our awesome handheld EKG! Your practices are going to shine with these members as part of your Anesthesia Team! 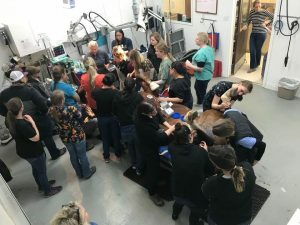 Our next Anesthesia event will be at Saratoga Equine in September (28th) and our Advanced Anesthesia Course will be Oct 18-20th at TN Equine. See you there !